Festival is open to all amateur choirs from the world, which will present their repertoire of advent, christmas and sacred choir music in the most prestigious churches in Krakow – Peter and Paul Church and famous Mariacki Church. 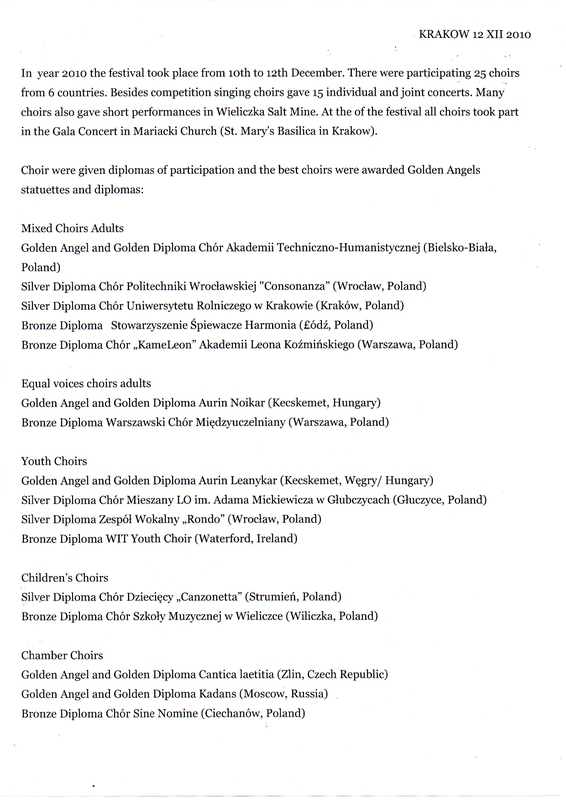 The international Jury panel will award Golden Angels and diplomas to the choirs in 6 categories. We also invite non-competetive choirs to take part. 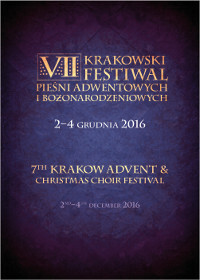 Choirs will also take part in additional concerts in Krakow. We hope that our festival will be great occasion to listen many magnificent choral performances and exchange of experiences with other choirs. Please read the rules in the next section. He began his piano studies as a child, at the Rimini Lettimi School. He later earned a Doctorate of Music at Ferrara’s Frescobaldi Conservatory. After earning a Master in Choral Conducting he studied music therapy with Professor Cremaschi of Milan University. His interests led him to the choral field, and he earned a Bachelor studying at the International Art Academy in Rome with Fulvio Angius. He also studied organ at Pesaro’s Conservatory of Music. Finally he got his PHD in Choral Music at the Cesena Conservatoire of Music. He is the Artistic Director and Conductor of the professional group Musica Ficta Vocal Ensemble that frequently performs in important Festivals in Italy and abroad. For many years, Andrea Angelini has conducted concerts with the choir Carla Amori, in Italy and abroad. In 1996 he was named Director of the Rimini Community Choir, Alessandro Grandi. He led this choir in several performances, including in important venues such as St. Peter’s Basilica in Rome – where he was able to personally meet Pope John Paul II – and in Milan’s Cathedral. He has led similar workshops in Romania, Belarus and China too. He is the artistic director and one of the tutors at the Rimini International Choral Workshop, where he teaches with Peter Phillips of the Tallis Scholars. Mr. Angelini is also the artistic director of the Rimini International Choral Competition. He is the Chief Editor of FARCORO , the Choral Magazine of the Regional Choir Association and of the International Choral Bulletin (ICB), the membership magazine of the IFCM (International Federation for Choral Music). 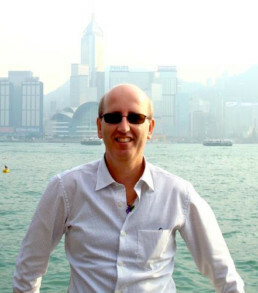 He has written numerous transcriptions and arrangements for choirs and chamber ensembles. His transcription of Faure’s Requiem is published by Gelber Hund Verlag of Berlin. For the American CanticaNOVA Publication, he has prepared transcriptions of important Renaissance Motets. He has published his composition with Eurarte and Ferrimontana. Her first experience as a vocal teacher dates back to 1981. From 1985 to 1988, she had a successful career as a most popular Estonian pop singer. She has received training in the Estonian Music Academy with professor Ants Üleoja. Thea Paluoja started vocal work with young soloists and ensembles at Rapla in 1990. In 1992, it was collectively named Rapla Singing Studio. Today in the studio she works with 4 choirs, 4 vocal ensembles and over 20 soloists. Choirs, ensembles as well as soloists led by Thea Paluoja have been successful in competitions both in Estonia and abroad. In Estonian vocal competitions, Thea Paluoja has repeatedly received the title of the best singing instructor and arranger. The Estonian Choral Association gave Thea Paluoja the Conductor (Music Teacher) of the Year title in 2006. She has also received the annual awards of famous Estonian composers Riho Päts and Gustav Ernesaks and has been the grantee of the Annual Prize of the Cultural Endowment of Estonia. In 2009 she received the Culture Pearl of the Year title. 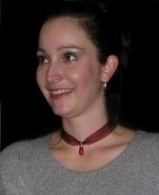 Veronica Lozoviukova finished Music Education Faculty of Charles University in Prague. She is a teacher at School of Arts Taussigova in Prague. She is conductor of leading choirs in Prague. 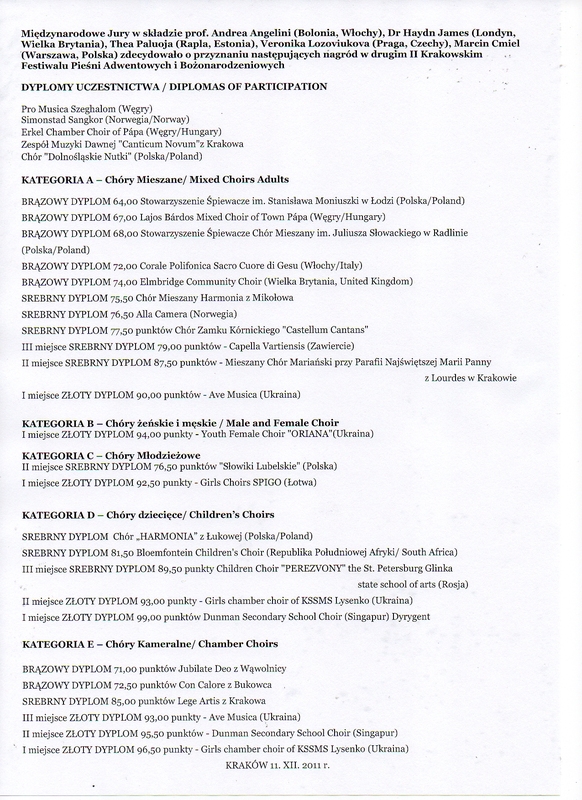 – Mixed Choir Post Scriptum and Children’s choirs “Moudivlacek” and “Fringilla” Except 3 choir singing she also teaches solo singing, piano playing and theory of music. With her choirs she received many prizes at national and international level. In spring 2005 her choir won a golden medal on international competition festival Mundi Cantat in Olomouc in category of adult chamber choirs. In November 2007 her choir won third place at International Warsaw Choir Festival “Varsovia Cantat” wining with nearly 10 choir in category. Also in 2007 her choir Fringilla won gold medal at National Competition of School’s choirs. Sasho Tatarchevski earned his master`s degree of choral, symphonic and opera conducting at the Faculty of Music in Skopje. He also participated on conducting master classes in New York, Rome, Berlin, St. Petersburg, Florence, Sarteano and Moscow. Mr. Tatarchevski has performed with the Macedonian philharmonic, the Macedonian opera and ballet, the Bitola chamber orchestra, the Orchestra Sinfonica di ICE – Rome, “Hermitage” Symphony Orchestra, the Bitola opera, the modern music ensembles “Alea” and “ConTempora”, the Symphony orchestra of the FM, “The soloists of the FM”, the Symphony orchestra of the BSF and many other choral, chamber and symphonic ensembles. Besides in Macedonia he has performed numerous concerts and won international prizes with various ensembles in Portugal, Slovenia, UK, Belgium, Greece, Switzerland, Spain, Croatia, Italy, Serbia, Bulgaria, the Czech Republic, Russia, Austria, France, Slovakia, Romania and Turkey. He also won several conducting prizes. 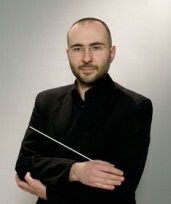 At the moment he works as a professor at the Faculty of Music in Skopje and conductor of the FM Symphony orchestra, the “Dragan Shuplevski” mixed choir, the Female choir of the Youth center and the “Pro Ars” professional chamber choir. Also, he is a regular jury member of several international competitions and artistic director of the International choral forum in Struga. One of the members who established Choral Society „LIRA” in Warsaw. In years 1997-2008 deputy conductor of Choral Society LIRA. Since February 2009 he has become the artistic director of Choral Society Lira in Warsaw He graduated from Warsaw Academy of Music in Prof. Ryszard Zimak’s class. 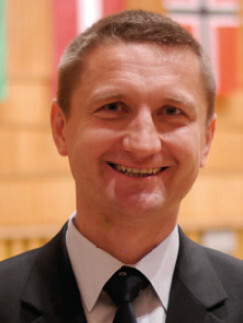 For years he cooperated with Warsaw University Choir and Stefan Wyszynski University Choir and others. He established and performed with choir Cantemus over 100 concerts. 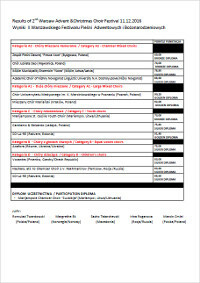 Jury Member of choir festivals in St Petersburg and Krakow. 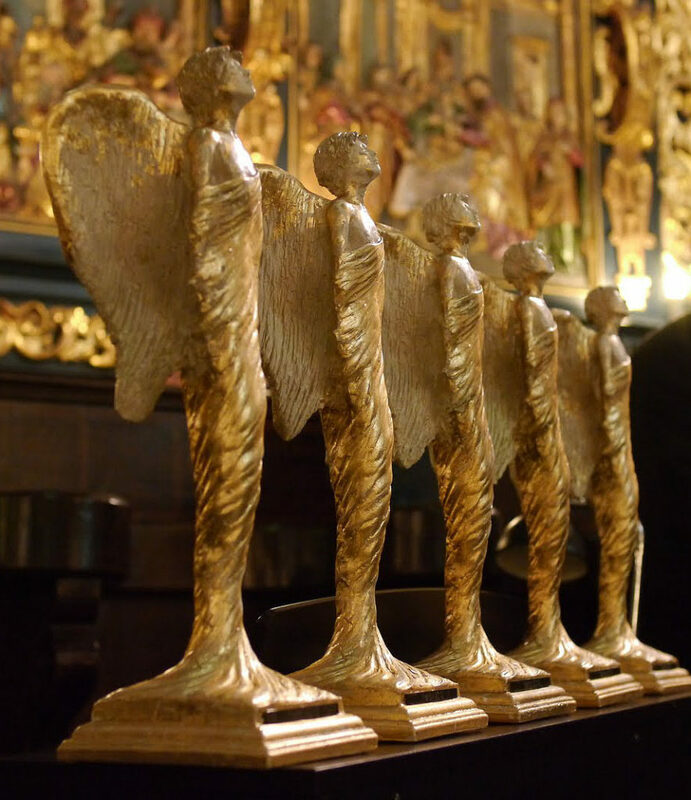 Statuette of “Golden Angel” – for the choir with Golden Diploma with highest no. of points in each category. 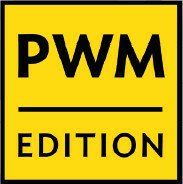 Any choir with lower score – diploma of participation. 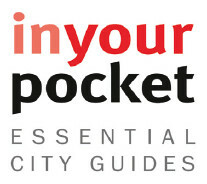 The Jury may award ex aequo prizes in all categories. The Jury may award also additional prizes and also more money prizes if festival has additional funds. Statuettes are hand made in Poland and are also beautiful work of art. Two weeks before arrival you will also receive a phone number to the volunteer who will take care of your choir during your stay in Poland. please write in title “name of your choir” All amounts we shall get net (you pay all transfer fees). You can pay the registration fee by credit card here. 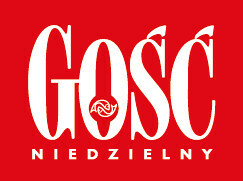 Partner of the Festival is Choral Society “Lira” Stefan Wasiak.